Deepen your sense of the past at sights like East Side Gallery and Memorial of the Berlin Wall. 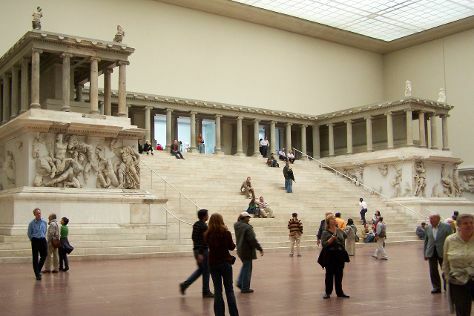 Your cultural itinerary includes sights like Pergamonmuseum and Potsdamer Platz. And it doesn't end there: examine the collection at Topography of Terror, view the masterpieces at Ariel Fantasy, pause for some photo ops at Brandenburg Gate, and step into the grandiose world of Charlottenburg Palace. To see where to stay, traveler tips, maps, and tourist information, go to the Berlin trip maker . Rio de Janeiro, Brazil to Berlin is an approximately 18-hour flight. You can also do a combination of flight and train; or do a combination of flight and train. Traveling from Rio de Janeiro to Berlin, you'll lose 4 hours due to the time zone difference. Finish your sightseeing early on the 18th (Fri) so you can travel to Vienna. Start off your visit on the 19th (Sat): browse the eclectic array of goods at Viktualienmarkt, take in nature's colorful creations at Nymphenburg Palace, and then take in the spiritual surroundings of St. Peter's Church. On your second day here, engage your brain at Deutsches Museum, take a stroll through Haidhausen, and then examine the collection at Munich Residenz. To find where to stay, more things to do, and tourist information, use the Munich vacation planning site . Getting from Berlin to Munich by flight takes about 3.5 hours. Other options: take a train; or drive. Expect a daytime high around 16°C in October, and nighttime lows around 5°C. Finish your sightseeing early on the 20th (Sun) so you can take a train to Vienna. Popular historic sites such as Belvedere Palace and Historic Center of Vienna are in your itinerary. Your cultural itinerary includes sights like Kunsthistorisches Museum Wien and St. Stephen's Cathedral. Pack the 24th (Thu) with family-friendly diversions at Prater. And it doesn't end there: see the interesting displays at Imperial Palace (Hofburg), get engrossed in the history at Sisi Museum, tour the pleasant surroundings at Schönbrunn Zoo, and hunt for treasures at Vienna Naschmarkt. Inspirock's itinerary builder makes planning a Vienna trip simple and quick. You can take a train from Munich to Vienna in 4 hours. Alternatively, you can drive; or do a combination of train and flight. In October, daytime highs in Vienna are 17°C, while nighttime lows are 8°C. Finish your sightseeing early on the 24th (Thu) so you can travel to Salzburg. On the 25th (Fri), stroll through Mirabell Palace, explore the historical opulence of Schloss Hellbrunn, then examine the collection at Red Bull Hangar-7, and finally take some stellar pictures from Salzburg Fortress (Festung Hohensalzburg). On your second day here, wander the streets of Steingasse, view the masterpieces at Residenzgalerie Salzburg, contemplate the long history of Mozart Residence (Mozart Wohnhaus), then explore the galleries of Mozarts Geburtshaus, and finally take in the spiritual surroundings of Salzburg Cathedral (Dom). To see photos, more things to do, ratings, and more tourist information, read Salzburg trip planner . Getting from Vienna to Salzburg by flight takes about 2.5 hours. Other options: take a train; or drive. In October, daily temperatures in Salzburg can reach 17°C, while at night they dip to 7°C. Wrap up your sightseeing on the 26th (Sat) to allow time to drive to Zurich. Museum-lovers will appreciate Swiss National Museum and Uhrenmuseum Beyer Zürich. Bring the kids along to Swiss Museum of Transport and Zoo Zurich. Explore Zurich's surroundings by going to Lucerne (Chapel Bridge, Kunsthalle Luzern, & more). Next up on the itinerary: wander the streets of Old Town (Altstadt), admire the striking features of Fraumünster Church, take in the architecture and atmosphere at Grossmunster, and shop like a local with Foundation E. G. Buhrle Collection. To see where to stay, traveler tips, ratings, and other tourist information, refer to the Zurich trip itinerary planner. Drive from Salzburg to Zurich in 4.5 hours. Alternatively, you can do a combination of train and flight; or fly. Expect a daytime high around 17°C in October, and nighttime lows around 8°C. Wrap up your sightseeing by early afternoon on the 31st (Thu) to allow enough time to travel back home.